As a college student, I am fairly busy from late August until early May. I still fish an inordinately large amount of time but not as much as I would like. When summer rolls around, I normally have to find work to make money for another year of school. However, I can usually squeeze in a trip or two to somewhere out of the ordinary. A couple of summer ago I was fortunate enough to spend time in Yellowstone and the Black Hills. 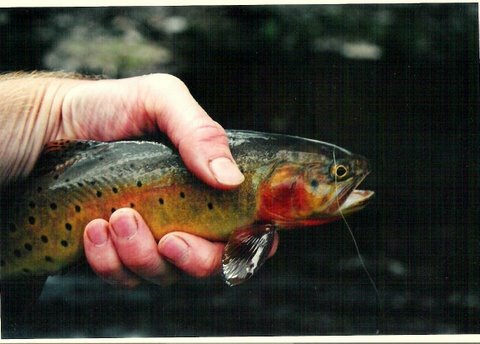 This past summer I landed a job in Colorado that let me fish Blue Ribbon trout streams every weekend. 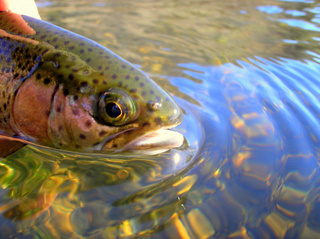 With visions of giant trout rising lazily to inhale any fly I offer, the trip planning commences once again. As anyone that has been there can testify, Yellowstone is beckoning me to its world famous waters. If at all possible I have to return to the Black Hills as well. This will be the third time if I make it. Colorado was great and I would love to explore a little more thoroughly, particularly in the San Juan Mountains. 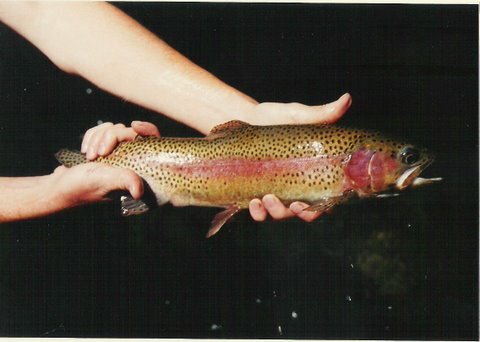 I have some tips on a high country lake that produces lots of 20 inch plus rainbows and willingly at that. The only downside is the 17 mile hike it will take. I have never fished in Montana so that is another place on the list to visit sometime. Even Arizona holds a special place in my heart and I could spend weeks there. 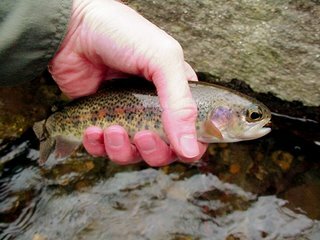 I could go on and on about waters I have fished or heard amazing things about but that isn't getting me any closer to the elusive trout that live in them. The cold days I spend on the water in the coming months will be warmed by my dreams of summer. During the days I can't fish, it is time to start tying flies and making concrete plans for the now annual pilgrimage west in my quest for that perfect day on the water. I could not stay in any longer. The temps were reaching well into the 60’s and even 70’s the last several days and I knew the fishing would probably be on fire. A small wild stream came to mind that had been a goal to fish for awhile. I did not know what to expect from this stream but had a good idea what it might be like. 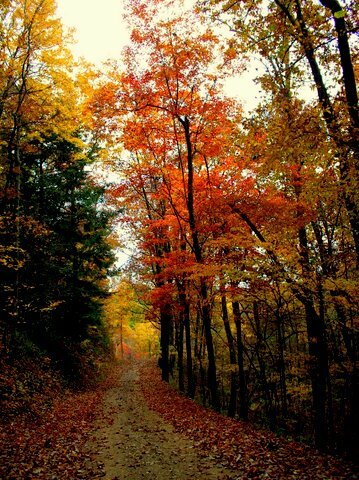 The fall colors were excellent but the drive still seemed a little long. After driving for what seemed like an eternity, I finally came upon the creek. It was a small tumbling mountain stream with plenty of nice small pools. After finding a good place to park, I walked back downstream and began fishing. A small parachute Adams seemed like a good way to start and I soon had the first monster on, all two inches of fighting rainbow. I had several more hits from very small fish so I decided to go subsurface. When in doubt, I find myself tying on a Tellico more and more and that is exactly what I chose. I immediately had a 6 inch rainbow on and things were looking a bit better. I worked through a couple very nice holes and caught a few more. My best fish came after seeing the fish follow the fly before fading back into his hole. I stealthily worked my way much closer to the deep pocket I saw the fish go back into and lobbed the bead head back in and let it sink straight down. 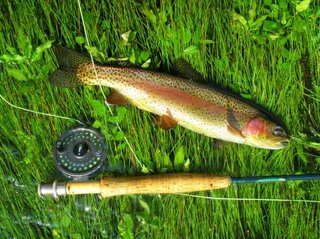 The line twitched and I set the hook, energizing this nice little rainbow to make several jumps before being brought to hand. The sky was heavy with dark clouds that flew from horizon to horizon. A gentle rain had been falling all morning and I was hoping that some good browns would be on the move. The river was low and clear and things were looking up. I decided to head up higher to water that was all wild fish and see what happened. A Tellico tributary was my goal and I flew along, over and around the ridges. 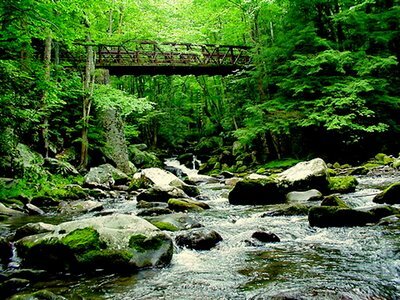 As I approached the bridge where I would first see the river, I noticed that the water looked awfully swift. Sure enough, the stream was high and off color. After a brief stop to make sure it wasn’t worth my time, I decided to head towards the upper Tellico and maybe some more tribs. High water seemed to be the theme of the day until I saw a stream entering the main river that looked semi normal. It was up and stained but not chocolate milk. “The fish should be feeding….” I thought to myself. I was soon in the water with a fish on and things were looking up. However, I couldn’t keep any more on long enough to get a good look at them. Finally, the thought came to me to do some exploring so I headed to higher elevations in search of a brookie. The normally small trickles that originate high on the mountains were a lot higher but not too dirty. I had a few hits before I landed my first monster brookie! A solid 2 inches!!! The Smokies are beautiful this time of year. The leaves are changing and it seems like everyone within a days drive of the park is here to look at the colors. The fishin' ain't bad either! Since it was fall break, a camping trip seemed in order with a healthy dose of fishing planned as well. My cousin wanted to come up for the weekend and I finally convinced him to try out fly fishing also. He was a natural from the start due in part to lots of previous spin fishing experience. After a quick demonstration to show him the method we would be using, he started fishing. Within 5 minutes, he had his first fish on! He caught a few more fish and is now thoroughly hooked. Being his first time trying to catch trout on the fly rod, he did exceptionally well. 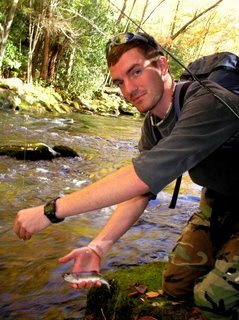 Many people find the Smokies fish to be a bit challenging at first but he was fishing like a pro in no time. Of course, I had to catch a few fish myself as well but none were particularly noteworthy this trip. I'll have to go again in a couple of weeks to try and catch some more large browns so stay tuned for more! As always, this summer was very memorable for me. 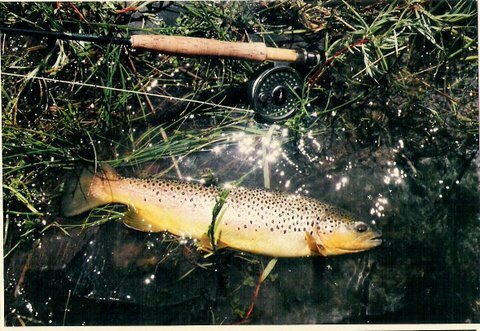 I was fortunate enough to land a job in Colorado in the Gunnison vicinity close to hundreds of miles of trout streams and numerous still waters. 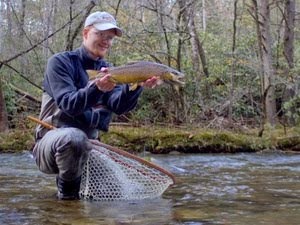 Every fly fisherman dreams of taking trips to the locations described in the glossy pages of fly fishing magazines and I was going to work within a couple of hours of several such famous streams. 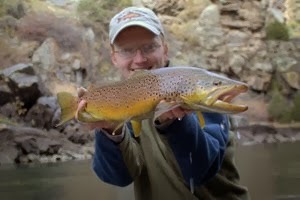 Of course I had to fish the Gunnison and its famous tributary, the Taylor River. Other lesser known streams would also provide some spectacular moments in the wilds of Colorado. I could tell story after story of various fish caught and almost caught. 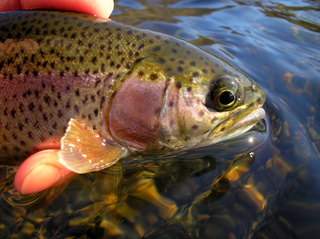 There was a 20+ inch rainbow I fought on the Taylor for several minutes before the tiny midge popped out. Wild brown and brook trout taken from pristine trickles high in the Rockies and then returned to the ribbon of liquid silver they called home. Then there was the 20 inch brown that sipped a CDC BWO emerger pattern when I did not have a camera with me. 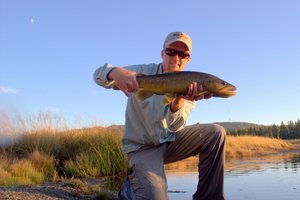 Three excursions in particular stand out as high points to my summer fishing. One was the large brown. The next was a day trip into the Black Canyon of the Gunnison. I finally convinced some friends that they would enjoy the killer hike 2000 feet straight down into the Black Canyon in the National Park. We arrived streamside and I rigged up while they searched for a good place to swim. I had a couple of bumps on a softhackle and finally landed a small brown but I know it should be a lot better. I finally tied on a Copper John and that turned out to be the ticket. I lost count of how many fish I landed, all browns (above-left) except for one beautiful rainbow (left). The fish were all very strong and full of fight. My final weekend provided the last great memory. Native Cutts!!!!!!!!! I was fortunate enough to get out and fish again this last weekend. 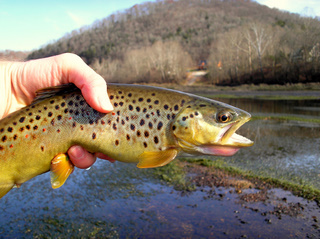 The Caney Fork had been on my mind for awhile so I drove down Sunday for a few hours of fishing. 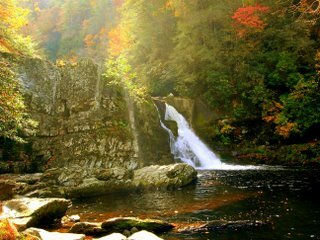 When I arrived, the water was still falling from the morning generation so I started in the large hole directly below the dam. Things were fairly slow even though I saw some fish working from time to time. I finally moved on downstream and was into fish quickly. The zebra midge came through again, but I never could really get in the zone with one color combination. I would catch a couple and then things would slow down. As soon as I tied another color on, I would usually be into fish again for a few minutes. This continued for most of the afternoon. All in all it was a slower day with probably 10-15 fish to hand. The weather couldn't have been better though so I'm glad I went. With the dog days of summer upon us, the area streams are getting low and clear. This creates a great opportunity to combine hunting and fishing. The ability to stalk your prey (the fish) and properly present a fly is of utmost importance at this time of year. I made the 20 minute drive to Daddys Creek, a stream that contains plenty of smallies in addition to redeye bass and other sunfish. 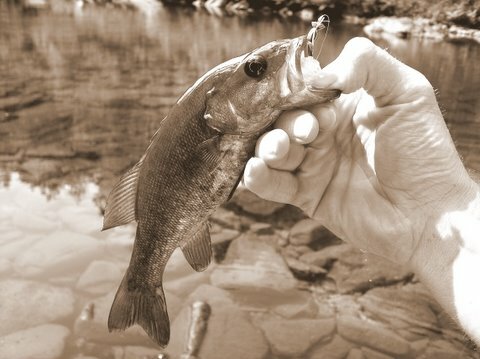 I have never done particularly well in my attempts to catch smallmouth, although I'm always able to interest a small one or two in my meager offerings. This day was not much different as far as the smallies were concerned. I managed a couple with the largest pictured here. I also caught some redeye and a pumpkinseed sunfish. The fish were earned the hard way however, as I had to stay out of the water as much as possible and make long casts that landed like a whisper on the still water. Further adding to the difficulty was the streamside vegetation which necessitated an inordinate amount of roll casting. 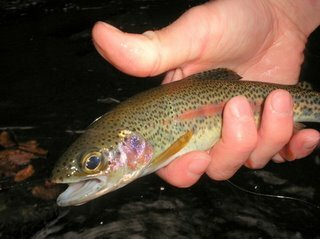 The trip was worth it though when the little 8 inch smallmouth (above) appeared like a ghost underneath my fly before sipping it as gullibly as a 20 inch rainbow on the Firehole River of Yellowstone taking a PMD Sparkle Dun. I gently raised the rod-tip and after a brief battle, I admired the beautiful specimen briefly, snapped a quick picture, and then watched the fish rocket back to whatever midstream lair I had just lured it away from. This report is a bit late, but I thought that I would post anyway. I made it down to the Caney Fork Sunday August 13 and Monday August 14. Sunday I fished the whole time at Happy Hollow, arriving at around 3 in the afternoon. The water was still dropping from the morning generation but was at a good wadeable level. I decided to try wet wading for a change as it was very warm. I fished hard for 3 or 4 hours and managed a few fish including this gorgeous 15 inch rainbow (at left). 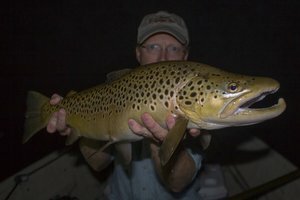 I also caught a nice brown that went about 16 inches. I had just switched to 7x tippet because I knew that the fish should be biting a little better. I spotted the fish working just below me so I made a slack-line cast downstream and the fish ate immediately. Because of the size of the fish, I was very careful to not put too much pressure on the tippet. I took a little longer landing the fish than I would have liked, hence no picture. The fish had enough stress for one day as it was. On monday, a friend and I decided to try a more out of the way access that he knew about. We arrived at around 8:00 in the morning and started working our way downstream. Just as it was the day before, the fish were not as cooperative as I thought they should be and we worked hard to coax in a few fish. Later in the morning, we moved upstream to Betty's Island and got into a few more fish, mainly recent stocker browns that weren't very large. Both days I stuck to my tried and true zebra midges and perhaps that is why things seemed slow. I probably should have tried experimenting a little bit more. At Betty's Island, the fish were rising to our dries fairly well which was rather interesting. 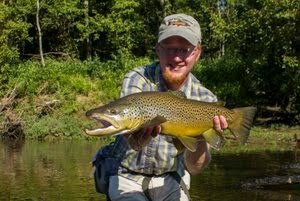 My friend had a very nice brown of probably 16-18 inches eat his midge dropper at Betty's but could not connect with the fish. 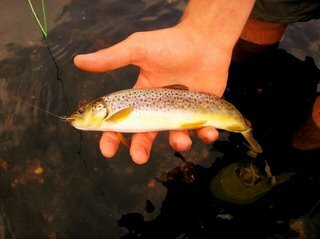 This last picture is a typical small brown my friend caught, the first of several for him.